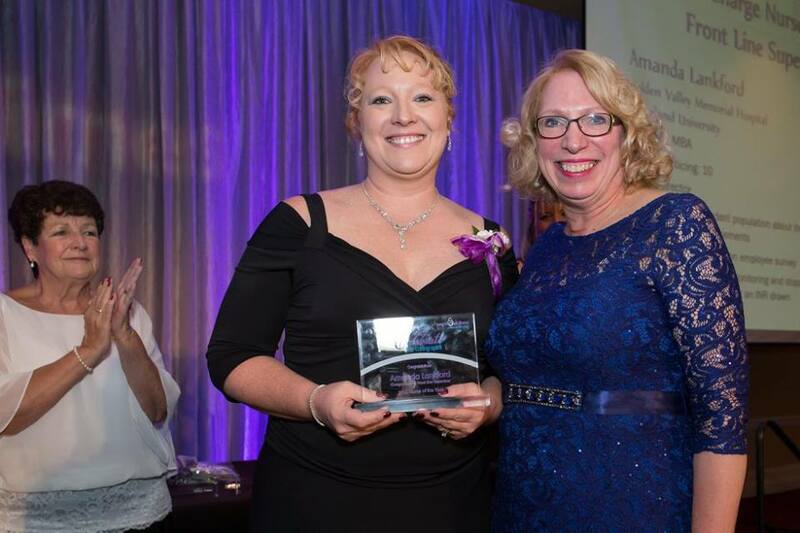 Dr. Liz Buck, 2015 Nurse of the Year Chair presents Amanda Lankford, Director Medical and Surgical Units at GVMH, with March of Dimes Nurse of the Year Award in Charge Nurse and Frontline Supervisor Category. Golden Valley Memorial Healthcare is pleased to announce Amanda Lankford RN, BSN, MBA was chosen to receive a 2015 March of Dimes Nurse of the Year award. Amanda was nominated and won in the Charge nurse and Frontline Supervisor category. Nurses are first nominated and recognized by colleagues, supervisors, friends, families, patients, etc. for their outstanding achievements in nursing. The nominees are asked to fill out an application which is reviewed by a committee who then selects the finalists. 2015 winners were announced at a special awards gala on October 10, 2015 at the Renaissance St. Louis Grand Hotel in St. Louis, MO. The March of Dimes honored nurses who exemplify an extraordinary level of patient care, compassion and customer service. Amanda has been the director of the Medical – Surgical units for eight years and has led the units to a higher standard of care and professionalism over that time. Her leadership has helped the organization achieve a number of awards such as the 2012 Missouri Excellence in Safe Care award, the 2013 Missouri Quality Award, the Studer Group’s Excellence in Patient Care Award – Most Improved HCAHPS. Amanda’s team has been leading the way at Golden Valley for quality and safe patient care.